From Freeway I- 5 : Take the Mercer street exit and turn right on Fairview and immediate left onto Valley. Look to your right – You can not miss the beautiful MOHAI building and just on the right is the charming Center for Wooden Boats. 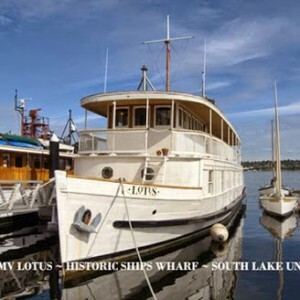 The Historic Ships Wharf is behind MOHAI on the lakeside. Lotus is on the first dock , east side – along with the Virginia V, Arthur Foss, Duwamish and Swiftsure. From the Seattle Ferry : Take the first right out of the fery terminal – go north on Alaska Way until you must turn right on Broad, left onto 5th (just under the monorail), then right onto Mercer, left on to Wrestlake Ave. You will see the Park on your immediate right. Public parking: on Westlake Ave, also the small lot in front of MOHAI and in the garage below the AGC building on Westlake Ave. Walking from Westlake – Cross into Lake Union Park at corner of Valley Street. Walk toward MOHAI and Center for Wooden Boats and walk down the right side of MOHAI on the wide concrete road / wharf. Lotus will be straight ahead of you. CWB will be on your right. The most current schedule for Lotus is on the home page. You can make a plan to catch up with us and tour or stay aboard in another city! Stay up to date with Lotus news and events straight to your inbox!